I repeat it often: the most important thing when hiking solo is to be smart and flexible. Going stubbornly into something we suspect is risky or straight out dangerous is not being brave, it’s being stupid. Sometimes our plans just don’t work out. For whatever reason. It could be that we have miscalculated something or it might be the nature playing tricks on us. Whatever the reason – there is no shame or guilt in changing plans; it’s a sign of sensibility and maturity. I've changed my plans more than once and it's just something you do at times. I’m sure you have already figured out why I am writing this introduction: yep, I need to change my plans. Obviously, I miscalculated – I thought the spring starts earlier around that area, but nope. The weather forecast warns of sub-zero temperatures and I am not ready for camping below zero. Although I am prepared in terms of the gear, I simply don’t feel like doing it. And so, my search started again – just a few days before my flight to Barcelona. It is good I don’t have any booked or paid for tickets or accommodation. I only have the flight tickets and hotel for my stay in the city. The other thing that has changed over the few past months is my health. After recent blood tests I finally know what’s wrong: I have a pretty bad anemia. This means I have low energy and am tired a lot. I know I need to be in a place that allows me really a lot of flexibility – I need to be close to towns or villages with bus stops, so I am not forced to walk much longer than I have the strength for. The down-side of this is that it could be much more difficult to wild camp when closer to villages or towns. The GR1 trail is pretty remote and provides plenty of quiet spots for camping without bothering anyone. In February no camping sites are open yet and I simply cannot afford to stay every night at a B&B or a hotel. The Montserrat Monastery. Photo credit. After spending many hours on the internet (Thank Goodness for the internet!) I found that there are a number of trails in the 60 km radius around Barcelona! Some are one or two-days-long treks, others are part of long thru-hikes. I wasn't interested in trails leading away from Barcelona as I was worried about the transportation back to the airport. GR92: Sender Mediterrani running along the whole coast of Spain. A very long (583 km) trail running all the way from the French border town of Portbou to Castellón in Valencia. It leads you along the gorgeous Costa Brava providing unforgettable views and quite some climbing of the coastal mountain ranges. I've also seen versions with added bits and pieces along the coast farther west - in Murcia and around Malaga, but I am not sure if you can walk continuously all the way there. This is a three-week long trail filled with natural beauty and rich in historical interest. GR6 leading from Barcelona as a pilgrim’s route to the sanctuary of the Patron Saint of Catalonia in Montserrat. Traditionally, it is supposed to be done in one day or one night, but as a hike, it's better to do it in two or three stages. It begins at El Vall d'Hebró, in the so-called Parc del Laberint and is quite a difficult and steep trek. GR97: De la Tordera al Llobregat, running halfway between Barcelona and the GR5 trail, ending in Sant Celoni. In a way it’s a shortcut of the GR5, taking the lower path, it connects Sant Celoni to La Beguda Alta. GR173: Circuit del Vallès, a local circular path close to Sabadell, which leads first through San Llorenc del Munt and the Sierra of L’Obac parks and then through the green lungs of Barcelona: Collserola Park. It's about 80 km long. 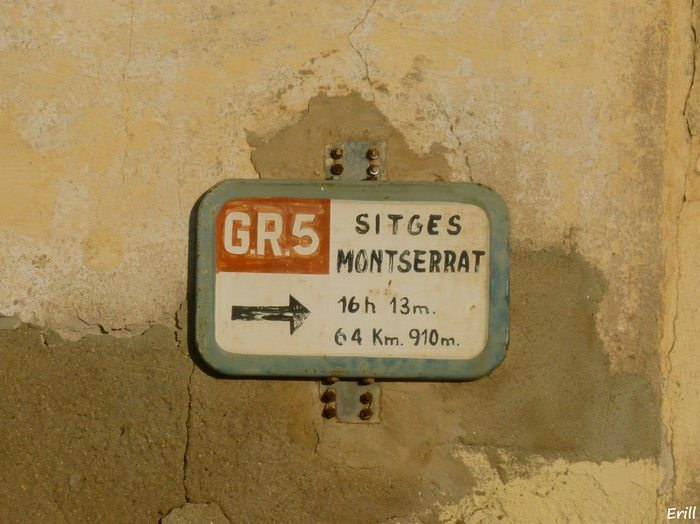 GR96: Cami Romeu a Montserrat– slightly different version of the GR6 leading from Barcelona to Montserrat. With its 53 km, it's a three-day long trek, starting in Cami Romeu. Els 3 Monts (more below). My interest, in particular, caught two of them – GR5 and the 3 Mounts Trail. As you can see the GR5 trail is a 200 km-long belt around Barcelona. This 214 km long trail makes a large arc around Barcelona. Starting in the coastal town of Canet de Mar leads through different nature parks: Garraf, Montserrat, San Lorenzo del Munt i l'Obac, Montseny and Montnegre-Corredor. For this reason, it is also called Sender Dels Miradors – Path of the Natural Parks. The trail seems to run clockwise, from Sitges in the direction of Montserrat, but I think I would be doing it the other way around. This way I would be getting closer to the Barcelona airport – making it easier to figure out how much more to walk or if to cut it all short. But I am not sure yet – it seems like the various towns on its way are well communicated with Barcelona and it might not make all that much of a difference. The trail is rich in beautiful landscapes and history. It passes through breath-taking views of mountains and rocks as well as monasteries and Romanesque churches. I am particularly thrilled to visit the famous Montserrat monastery. I found this trail description on wikiloc site by user “Erill”. Watching his photos is quite exciting and I don’t even feel bad anymore for leaving the GR1 for another time. Book your stay in Barcelona now! The Three Mounts Trail leads for 106 km from Montseny to Montserrat, through Tagamanent, La Mola, and Mura. Along the Els 3 Monts route, the culture of a territory inhabited since time immemorial appears not only in the shape of Romanesque hermitages or typical farmhouses but also outstanding Modernist buildings. Today some of these historically significant buildings are now home to exceptionally high-quality hotels and restaurants. It might be that I decide at the very last time, maybe while standing in Montserrat (or Montseny if going the other direction). It seems that the 3 Mountain Trail is an initiative to bring tourists (and clients) to the area, as it takes you through 10 villages and encourages patronage in local restaurants and hotels. If you are thinking of going hiking, make sure you have the right clothes to be comfortable and safe! So, that’s what it looks like now for me. I am actually happy with the change as those trails are very well marked and seem pretty safe even in February. Will do GR1 some other time :) I'm sure that hiking near Barcelona will be as much filled with beautiful vistas as Sender Historico would have been! Now – off to pack the last things! Flying on Thursday night (on the 9th of February - my 40th birthday!). Soy celíaco. Si consumo algún alimento que contenga trigo, centeno, cebada, avena, kamut, espelta o triticale, o bien sus productos derivados, puedo enfermar. Esto incluye la harina, pan, pasta, croquetas, dulces, salsas, algunos embutidos… Los celíacos podemos comer carne, pescado, huevos, legumbres, frutas, hortalizas, arroz, maíz, soja y también patata. Estos productos se deben cocinar sin harina, cocidos, a la plancha, a la brasa o bien crudos. Si durante la preparación de la comida le surgiera alguna duda, por favor consúlteme. Gracias. Have you hiked in these area? Would you suggest or recommend one of those trails in particular?